It has been just over a month into the new year and we are excited to give you the first release of 2018. Over these years, with each release of Fedena, we have loved to hear from you what works and what does not work for your institution. With this release, we are bringing to you two such features you asked us – a new and refreshed Gallery plugin and a Tax module on Fees – as well as bringing back two features that were deprecated from Applicant Registration last year. 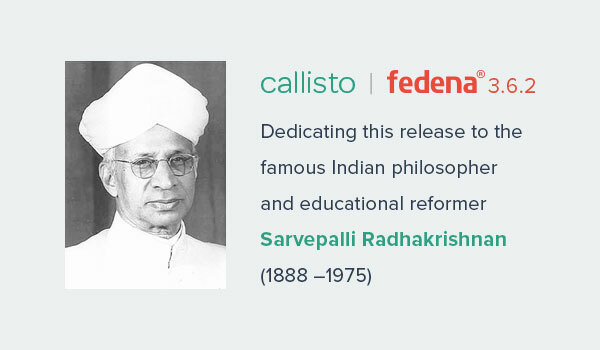 Fedena 3.6.2, codenamed Callisto after the second largest moon of Jupiter is dedicated to Dr. Sarvepalli Radhakrishnan, an Indian philosopher, and statesman who was also the first vice-president and second president of India. Dr. Radhakrishnan’s birthday which falls on September 5th is celebrated as teacher’s day in India since 1962. He was born in Tiruttani, a small temple town in Tamil Nadu. He was awarded scholarships throughout his academic life and went on to study at the prestigious Madras Christian College at the age of 17 and graduating from there in 1906 with a masters in philosophy. Unlike many of the early politicians in independent India, Dr. Radhakrishnan had a long academic career before assuming a public office. After graduation, he served in various capacities at the Madras Christian College, Mysore College, University of Calcutta, Harvard University, Harris Manchester College, Oxford among others. His term in the League of Nations, UNESCO, Constituent Assembly was well appreciated. He was elected as the first vice-president of independent India in 1952 and became the second president from 1962-67. A true statesman, he helped spread the idea of a fledgling democracy among the other countries with his knowledge and understanding. The all new tax module allows institutions to enable tax on all types of fee transactions – general fees, instant fees, transpor, and hostel fees. This module can be used for VAT or other similar tax systems. To collect tax on fees, enable it from the settings page in Finance section. Add the various applicable tax slabs and enter details such as the Tax Identification Number. Tax is applied on fee particulars for general and instant fees and applied on fee collections for transport and hostel fees. The applicable tax slab is selected before the collection is scheduled and recorded in the various fee reports when the fee is actually collected from the student. Tax reports show the total amount of tax collected under each slab. 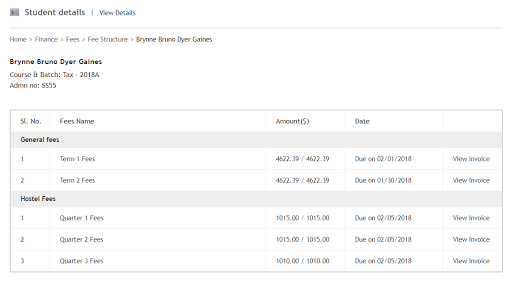 Invoicing is now available as a setting in Fedena. When enabled, all scheduled fee collections will have an invoice number based on a set starting sequence. Fee receipts will also show the invoice number against which the payment was done. Invoice is available for all pre-scheduled fees like general fees, hostel fees, and transport fees. It does not apply to instant fees. Users can be blocked from accessing the application for reasons like non-payment of dues with one click. The page has been redesigned to improve the search experience. The new gallery plugin has a modern and refreshed UI along with new features and updates. Photo sharing now is moved to the albums instead of individual photos for faster sharing. Public albums can be used to share the album across all users. Other updates include adding multiple photos at once, album delete etc. 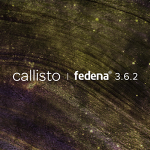 Try out the all-new gallery plugin that is coming soon to Fedena Mobile app also. What is enhanced in Fedena? Two features which were deprecated – Subject-based registration and PIN-based registration are reintroduced in this version. Other new features include an ability to contact an applicant via SMS and Email, detailed CSV report of applicant data, printable application form, fee receipts and fee assign during allocation to a batch. 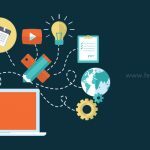 A new formula to connect exams – Average of best ‘n’ – along with many fixes to enhance the ever improving new module in Fedena. Coming up next – end of year report cards.